How we celebrated our 38th wedding anniversary. I will tell you. 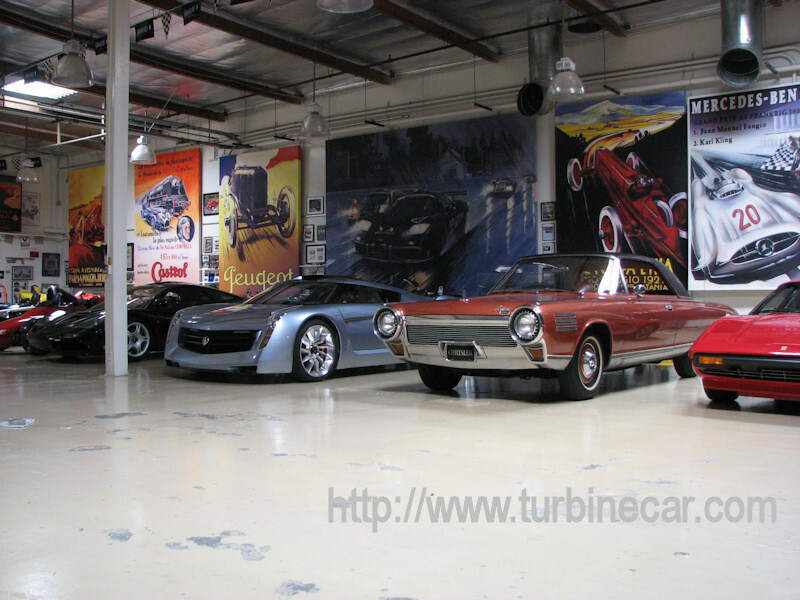 . . A very well known car collector by the name of Jay Leno was fortunate enough to be able to somehow obtain for his stunning collection, one of the last remaining turbine cars (number 42). He took delivery of the car in June of this year. 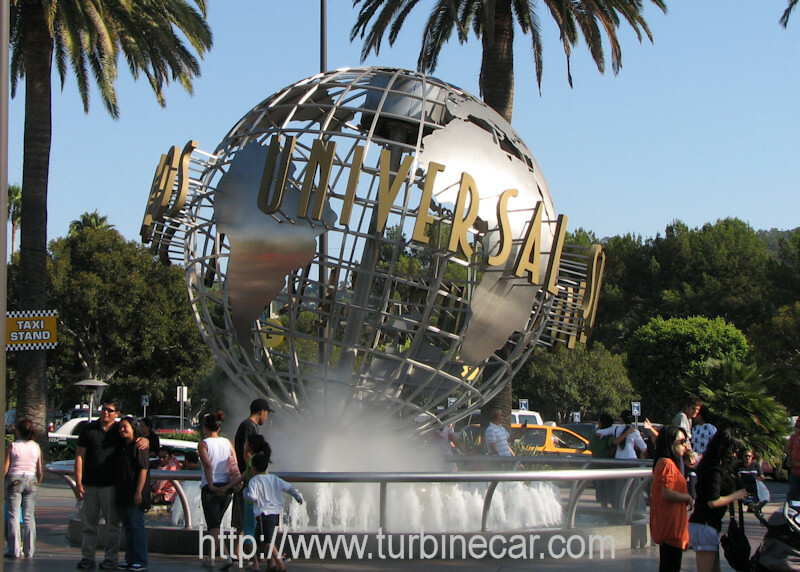 He had known of me and my web site (www.turbinecar.com) for some years as he too loves the idea of a turbine powered car and the only real production American turbine cars were the cars like the one we drove built by Ghia of Italy and powered by the Chrysler engine. Now Jay is a true “car nut” and “gear-head” if there ever was one. Jay called me to tell me personally that he was getting the Chrysler car the day before he got it. That was June 15th and the first time I had ever had the pleasure of talking to Jay. 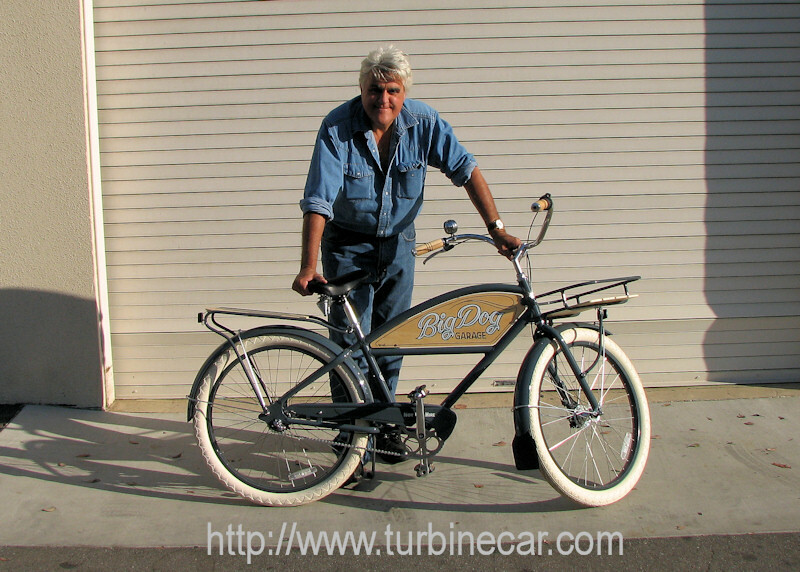 During the course of that first conversation, Jay asked, “do you ever get out to California?” I answered, “why would I want to do that?” He said, “so you can drive the turbine car and see my Jay Leno’s Big Dog garage.” Sold! I am going to California! When should we go? I would have packed up the next day but we were already packed, in fact, we were on vacation in Michigan when Jay called. It actually was the first full day of the two weeks we had planned and the second week was grand kids time in St. Louis with our son and his family so the immediate future was out for a trip to California. Sometime during one of the driving days over the next two weeks Lynette and I decided that we would go (if Jay said it was okay) over the August 7th – 9th weekend. That was our wedding anniversary and we always do something like maybe stay in the Twin Cities or whatever. This time it was flying to California to see Jay! 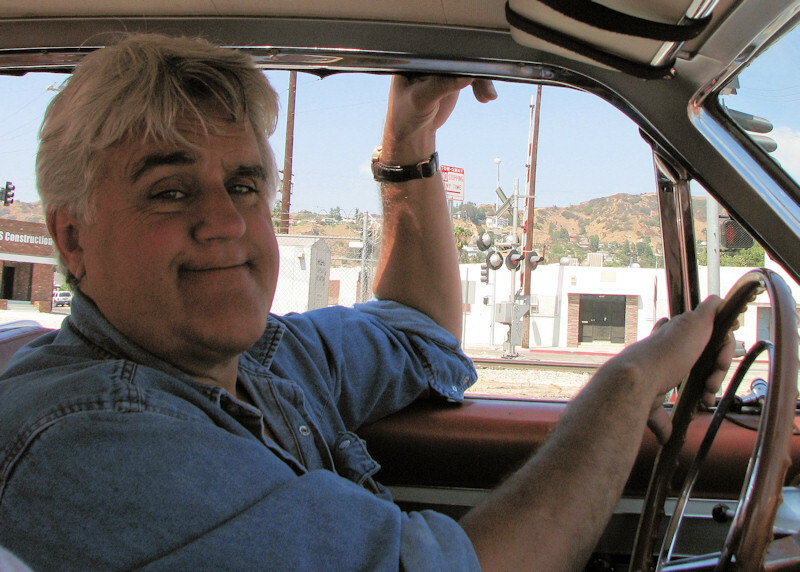 For those of you reading this who might have been born under a rock, Jay is also the former host of the Tonight Show and has a new show “The Jay Leno Show” on NBC at 9:00 coming this fall. No, Jay did not make me say that, I figure a plug for his new show here is the least I can do for such a great guy! I called Jay the week we got back from our vacation and asked if the 7th of August would work as it was our 38th wedding anniversary and we had time off for that already. Jay called back the next day and said he could work us in but he had a show in Las Vegas on the 7th and 8th and would we like to go with him? Hello! Did I just hear you right? You want us to go to Vegas with you? I would think that over half the population of the US would like to go to a show as your guest and the other half are the people you interview for “Jay Walking”! So the date was set and we purchased airplane tickets for Burbank. We were arriving on the 6th and leaving on the 10th of August. I called Jay again just before I made the reservations (non-refundable) to make sure we were good. At some point during that discussion, Jay said he would arrange a hotel for us, so we did not have to do that. He had a deal with the Holiday Inn Media Center in Burbank. 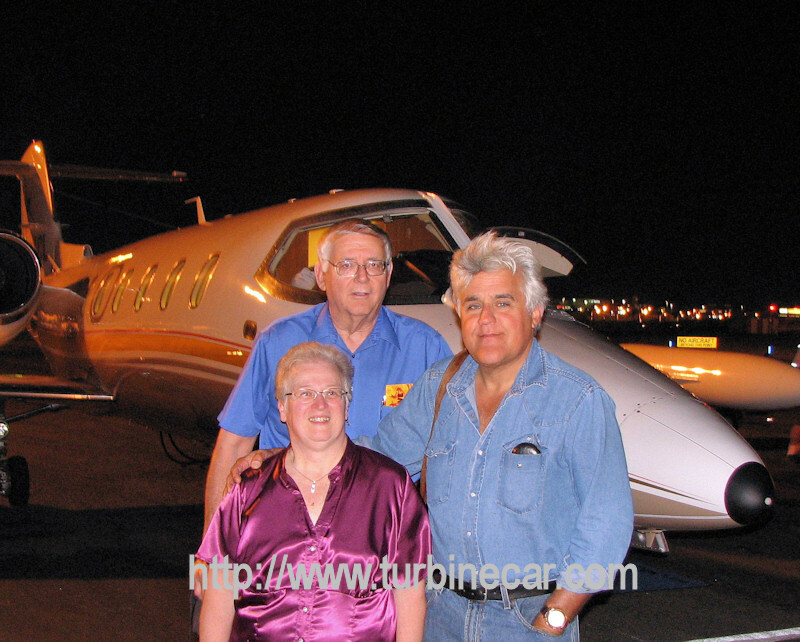 About that time was the first time I had to pinch myself to see, am I really talking to one of the most known individuals in the world who just offered me, someone he has never met, a chance to drive his turbine car, fly to Vegas and see his show and now he is offering to spring for our lodging! I was very surprised to say the least. So the date was set! By then it was still over a month away but we were counting the days. I sent some copies of information I had on the turbine car to Jay and was working on getting anything else he might be interested in. I have a large collection of material I have used on my website which I am more than willing to share with anyone who has a need for it. I believe that history is the most important thing we can share. Without history, we keep making the same mistakes and re-inventing things that were already done once and that is just plain stupid! Lynette and I arrived in Burbank about 6:00 pm on Thursday the 6th of August. The flight(s) out were pretty good except I will NEVER accept a ticket with a half hour between flights again at any terminal and I want even longer if possible at Salt Lake City. We talked to Jay that evening and he said he would meet us around 2:00 pm at the garage on Friday. Friday morning we ate breakfast at the hotel and wandered around downtown Burbank for a while. We caught a cab around 1:00 pm and learned that cab drivers don’t have a clue where Jay’s garage is. It took a little longer than it should have to get there (about 6 miles from the hotel) but the guy was nice so I didn’t feel bad about tipping him a little extra. Jay’s Big Dog complex is kind of hidden in plain sight. We called Jay’s shop manager on my cell phone and he opened the gate to let us in. Jay was not around and he had left no specific instructions to his staff about Lynette and me so we could not take any photos till Jay said it was okay. 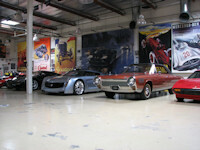 No problem, we went with Bob and started touring the Big Dog Garage. Jay showed up around 2:15 pm and greeted me with Hi, Mark! Then Jay kidded me about the car not running. I was fully ready for that to happen because over the past ten years I have tried multiple times to get a ride/drive a turbine car again and every time success was close, fate intervened and kept it from happening. I did get to hear one run in St. Louis this past June along with my son, his family and Lynette. 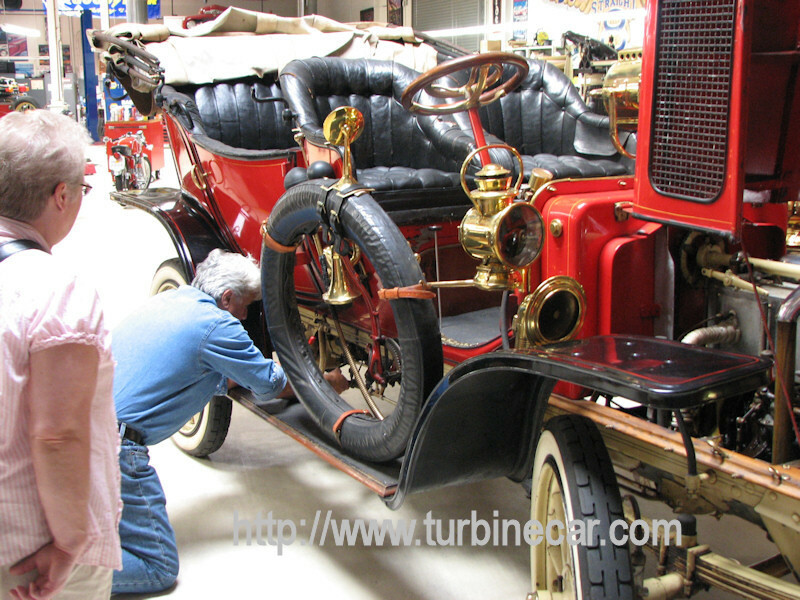 It was the first time any of them had seen a turbine car actually running. Jay behind the wheel of the Chrysler Turbine car. First thing we did with Jay was to take the long awaited ride and have a chance to drive a turbine car again after 44 years. Jay took the car about five or six miles towards downtown Burbank and pulled onto a side street where he turned the car around. Then it was my turn! I got behind the wheel of an operating turbine car that I could drive again. I was a little more nervous than the first time in May of 1965 when, with my father at my side, I took the first spin in a turbine car. 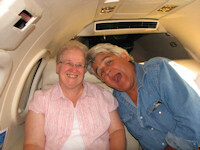 Now I had one of the most famous people sitting next to me and my loving wife of 38 years in the back seat. I was also in Burbank California, which was still kind of new to me. (I remembered how to get the selector into drive, as it is a little different than almost any other car. You have to pull up on the outside lifters and the whole thing pops up to where you can move it to drive.) It was a good thing that traffic was not too heavy. I slipped out into traffic cruising down N. San Fernando Blvd. I felt like it was all a dream that I had dreamed before. I kept having deja-vu all day as various events were happening; I had two of Jay’s employees ask if I had met them before too – that added to it. When we got back to Jay’s garage, he let me drive it into the building and asked, “are you any good at backing up?” I feel I am, so I said “pretty good” so he let me back the turbine car back between his Eco-Jet and a Ferrari 308 – I realized that wow, I could have done some major damage there if I screwed up. Where I parked the turbine car. We went over to the shop and gave Jay some more stuff we brought with us, photos, etc. He showed us around the shop a bit and then let me go back across the way to the big building where I could take some photos while he got the 1907 White steam car ready for a ride. After Lynette and I wandered around the big garage for about twenty minutes the shop foreman came over and told us it was about ready to go. Well, that was not quite true. It was now about 4:00 in the afternoon and first the burner refused to stay lit on the White and then the throttle valve was frozen solid. This was odd since Jay had just used the car the Saturday before to give another turbine car guy, Steve Lehto, a ride. It took about forty five minutes for Jay and two of his crew to remove, disassemble and lubricate the throttle mechanism. Once back on the White we took off into rush hour traffic on the streets of Burbank. I felt they were a little surprised when Lynette climbed into the back seat of the White, but hey, that is the woman I married, if I get a neat ride, she is going too. After about a half a block, I began to wonder if it would be my last ride. Jay is very comfortable with steam powered antique autos but for me this was a first! The first time I ever rode in a brass era car and the first steamer I had ever ridden in. To be honest, it is really an uncomfortable feeling to have nothing to hang onto, sit in a real “bucket” seat without any seat-belt or other safety appliance and realize that the driver can’t see much of anything on the left side of his charge. More that once Jay asked me to check the traffic to see if he could move over into the left lane. I asked Jay what he does without a “shotgun” ,he said he just moves over and the people get out of the way. Jay took me to Autobooks-Aerobooks in downtown Burbank because it is one of his favorite hang-outs. I bought a very good book on the Maxwell Auto company. We said goodbye to the crowd that formed around the White while we were in the store and headed back to the garage. I told Jay not to even think about asking me to drive, I think that was never the plan anyway. Back at the garage, we had about fifteen minutes alone in his library (very cool stuff there) while he had some work related stuff to do. He came in dragging his big old leather briefcase stuffed with mostly auto related stuff from what I could see. I saw something I had given him in his briefcase and felt honored. Jay then got one of his favorite cars ready (1972 Mercedes 300 6.3) and we left for the short trip down the street to Million Air’s terminal at Burbank. We walked straight to the waiting Lear 35 and climbed in after Jay. The staff offered beverages and snacks and we settled in with Lynette sitting next to Jay on the back double wide seat and me across from her in a rear facing seat. Before we left, Jay asked what we were going to do in Vegas, as he really did not expect us to catch his show, I guess. We both said, “we want to see your show”, so he called the hotel and had tickets reserved for us. That was going to be one of our big highlights of the trip but I guess Jay just wanted to be a good host and not assume we wanted to see him perform. The trip was pretty nice and I got a great photo (with Jay’s permission) of Lynette and him on the same seat. I have a new respect for private jet travel for people in Jay’s position. I asked if he ever traveled commercial and his reply was that if they were dependable and offered better schedules so he would not have to waste valuable time in airports and waiting for missed planes or connections, he would consider it. He said these private trips are very expensive but people are depending on him being there for the shows and meetings or whatever and with a private jet, you get there on time. We had just experienced commercial travel and had another day of travel ahead of us and I have to agree that it is not dependable or convenient. We landed at Henderson Airport in Las Vegas and went right into a waiting limo. The trip to the Mirage was very interesting as Jay has been coming to Vegas for many years and has seen new casinos built, used and torn down and replaced over the years. He pointed out many sights that he thought we would find interesting. You can’t help but feel how much of a waste most of Las Vegas is in both time and money. But then it is a booming industry that creates nothing and costs a lot to many people. We arrived at the Mirage through the back entrance and were greeted by Roy, the manager of entertainment for the hotel. Roy escorted us to Jay’s dressing room and after a brief conversation left to wait outside. We asked Jay if we could change clothes from our garage clothes to a little fancier attire for the evening so he let us change in his dressing area. After getting changed and talking for a few minutes he had Roy take just Lynette and me to Kokomo’s Restaurant. Roy pointed out many of the things along the way mostly to help us find our way back to the theater. We walked into Kokomo’s and Roy told the staff that we were Jay’s guests, we were seated and had a wonderful, relaxing, and delicious meal. Kokomo’s is an American style restaurant with mostly beef and seafood items. Lynette and I enjoyed a very American meal and a very large serving of cheesecake with tart cherries on it for dessert. I can really say that Kokomo’s is a very fine place to eat. We finished our meal close to 10:00 pm and headed back to the theater. I depended on the signs to find my way as navigating around those casinos is difficult. They don’t want you to find your way out, you might go to some other casino. We were seated about four minutes before the lights dimmed. While being seated, I asked how to get back to Jay’s dressing room after the show as he was our ride back to Burbank. The Alley Cats were Jay’s opening number and they are great! I love A Capella singing and I love the songs from the 50’s and 60’s, so they were great combination. Jay came on and did a longer version of his monologue, very much like his old Tonight show. He is very well liked and the show was sold out from what I could see. He can still make people of all ages laugh! After the show, we found our way back-stage and were escorted back to his dressing room. Jay was already back in his denims and relaxing on the couch. We had some water and took care of necessary things before the forty five minute ride back to Burbank and left to meet Roy and company outside the door. They escorted us to the back of the hotel where we boarded the limo for the airport. Lynette, Me and Jay on the runway in Vegas. Jay had the pilot take our picture on the runway and I am glad he did. I was trying not to be a pest about taking his photo because I was just happy enjoying his company and the time we spent with him. The flight back was pretty much like the flight over to Vegas and we arrived at Million Air about 1:30 in the morning Saturday. On the plane Jay told us that he had arranged for tickets to Universal Studios for us and asked how we were getting there. Lynette said probably the Metro bus. Jay asked when we planned to go and said that he had to work on Saturday and he would call around that time and pick us up and take us to Universal Studios. So we had the pleasure of saying to Jay “goodnight, see you in the morning!” in front of the people that were still around outside the hotel. Saturday, about 10:00, Jay called the room and said he would be there in about twenty minutes; we got another call about fifteen minutes later saying he would be there in five. We got down to the lobby just as he was pulling in. He drove by NBC studios, where he works, and then on to Universal Studios. He gave us his cell number in case we had any trouble getting the tickets. We had a great time with much better tickets than we probably would have purchased ourselves. About 5:30 as we waited for the bus to take us back to the hotel, it was like Cinderella when the clock struck midnight and now we were back to just Mr. and Mrs. Olson waiting in L.A. for a bus back to the hotel. We had a good flight back Sunday and we got a call from Jay Monday morning checking to see if we got home okay. I don’t know what I could ever do that would equal the great time we had, so I probably will not try. It was just a once in a lifetime anniversary!